Okay it wasn’t ‘crack. It was acid. And the thing is that we had just been talking about Mandrax… I best be a little bit clearer. Last weekend my friend and I were yakking away. She turns 90 in September and wants to go white water rafting. (She also wouldn’t mind going for a spin in a race car at Silverstone if you’re offering… she was one speedy driver pre the whole bindness/ageness malarkey.) She was annoyed that now there were things her body just couldn’t do anymore…wished she had taken more risks earlier. 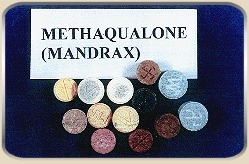 Methaqualo ne is a sedative-hypnotic drug that is similar in effect to barbiturates, a general central nervous system depressant. Its use peaked in the 1960s and 1970s as a hypnotic, for the treatment of insomnia, and as a sedative and muscle relaxant. It has also been used illegally as a recreational drug, commonly known as Quaaludes (pronounced /ˈkweɪluːdz/ KWAY-loodz) or Sopors (particularly in the 1970s in North America) depending on the manufacturer. Since at least 2001, it has been widely used in South Africa, where it is commonly referred to as “smarties” or “geluk-tablette” (meaning happy tablets). My friend found this fascinating. She said as a mother and a teacher, she seemed to have missed the entire 60’s drug revolution and wasn’t sure quite how. ‘How do they make you feel?’ she asked. There was good news too this week. Dad few back to Zambia from hospital and by the time I had made contact to see if he had recovered from the flight, he had ALREADY done a sneaky farm clinic and been driving himself around Lusaka. Pretty phenomenal considering the doctors reckoned on 6 months to a year of slow recovery. He is loving being home too after months of anxiety, pain and hospital food. Hooray!!! Then yesterday, after several weeks facing potential downsizing to Big Issue Seller due to an administrative error by my local Job Centre Plus, I was told with a muttered apology that my benefits had been reinstated. I am not going to be homeless after all! 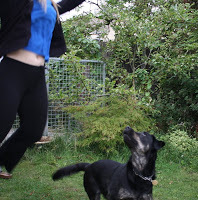 This made me so happy I decided to teach Grace to fly. I use a ancient martial art technique called simply ‘Inflated Breast ‘which is crude but effective and hugely fun. 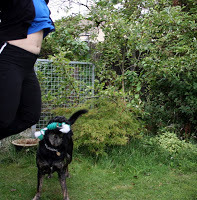 Once Grace figures it out we’ll be a lot safer….I do have a tendency to fly into trees….. Wish I had known about the Mandrax Run when I was in Zambia – I would have kept my eyes peeled for shiny GTIs. Of course, since I was there with a mission group there was probably no way I was going to learn about that activity – but I just know that some of the college students I hung out with would have known (& possibly participated). What a relief about your benefits and glad to hear the JobCentrePlusHorrible gave you an apology. Great news about your Dad. I love the puzzled look on Grace's face. And I'm glad other things are turning themselves around for you.